With solid brass construction and an easy-to-clean spout, the VIGO Niko Vessel Bathroom Faucet brings a graceful elegance to your bathroom. The uniquely shaped spout creates a relaxing waterfall effect as water cascades into your vessel sink. The quality components, including a leak-proof sedal ceramic disc cartridge, let faucet add just the right amount of luxury to your bathroom. Dimensions 6.0 In. X 2.0 In. X 10.5 In. 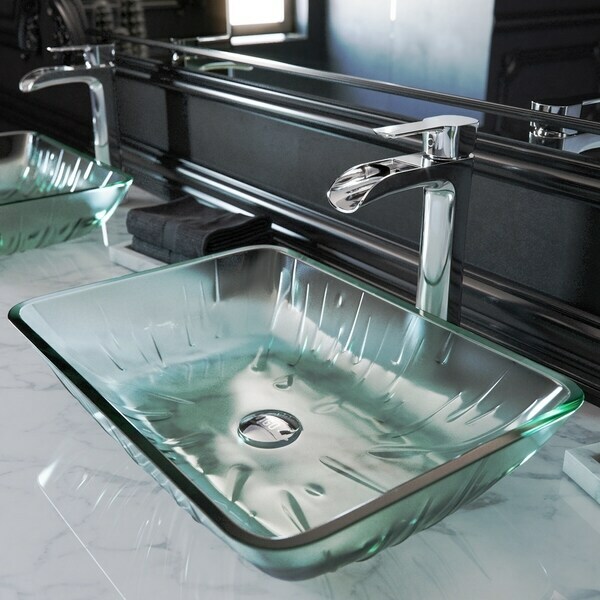 I bought this faucet to complement a silver foil vessel sink I also purchased from Overstock. 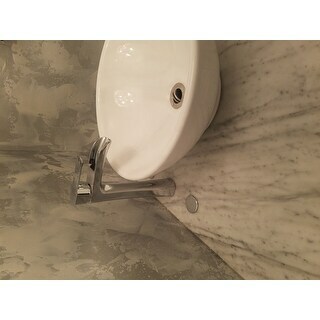 I was surprised and impressed at how solid and well made this faucet is, and how well it complements the vessel sink. Looking forward to finishing my half bath update. I have purchased several items from Overstock, and have never once been disappointed...always high quality offerings. Can't beat the price for this quality faucet! I would highly recommend this product. It is well made and is actually the second faucet I purchased, the first was the same style in brushed bronze. It looks very nice in my bathroom and for this price and quality it is an easy way to update a bathroom in a fabulous way! Beautiful, heavy, feels and looks expensive. So excited to use these in my new bathrooms!! The construction is impeccable. Vigo hit it out of the park on this one, even the box it was shipped in was high quality! This faucet added a touch of class to a standard bathroom. This faucet works great with the vessel sink I purchased! Great water flow and sleek design. I would order again! Clean lines, hefty in weight (so, I know this piece will stand the test of repeated use), and simply elegant. Perfect for my transitionally themed bathroom remodel. Unwrapping this faucet was like unwrapping a beautiful piece of jewelry. It was packaged very beautifully and was shiny and gorgeous. It has a nice heavy weight to it and pairs beautifully with my vessel sink. Plumbing isn't finished yet but looks stunning. Great heavy piece. Well made and perfect touch to my powder room. Great packaging and construction. Does not have cheap look are feel. Sturdy and Very statley faucet. Great water flow, not too much. Very happy with my purchase. This is a very nice faucet. When installing, you can opt to have it pour out more forcefully, which is the higher setting. The wife loves it on the higher setting. The water comes out of this like a waterfall. I love this water dispenser! So glad I bought this. Gorgeous!! Heavy. Perfect height for a vessel sink. Love it!! "since it did not come with a drain plug can anyone recommend a brand that works well with it or just any chrome one looks fine? Thanks"
You may like ITEM#: 11941565. I love the waterfall feature and was looking for a faucet that wasn't square and so contemporary. This faucet has a softer look. I had purchased a vessel sink that came with a faucet. When the weather freezes, the faucet leaks. This is to replace it - I liked the style and mfg specs.